There’s a lot to be said about a nice view, but some houses pay a price: hot rooms, too much sun and an overload of destructive UV rays, which can fade furniture over time. Solar shades, also known as solar screens, are one easy solution to tackle all of these problems at once – without eliminating your beautiful view. Maintain your view while reducing sun glare even when the solar sun shades are down due to the mesh blind fabric that allows only a certain amount of light in–and allows you to keep looking out your windows. Standard blinds and curtains can block sunlight, but they’ll also block your view. Save energy costs because solar shades are great for heat management. Properly installed solar screens can result in a 15-degree difference in temperature. Reduce furniture fading. Solar shades can knock up to 86% of harmful UV rays from entering your home. Eastside Awning–serving Seattle, Bellevue, Kirkland and other western Washington cities–is well known for creating and installing durable motorized solar screens that reduce glare and keep your house cool in the summer. We use Solair Power Screens and Tucson Solar Screens™. Solar screens cool your room and reduce glare, while allowing gentle, filtered light to enter the room. 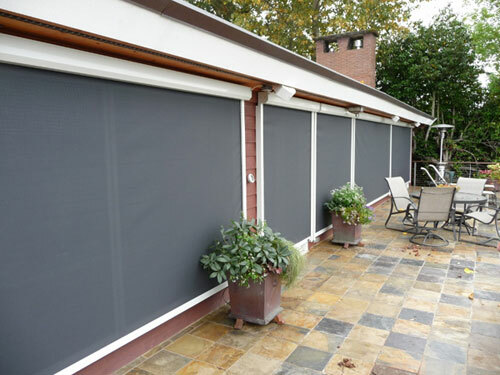 Let the view in, but keep the heat out with our rolling solar screens. Contact us today to learn more about how solar shades can enhance your home.